Well, I'm just coming off a week's vacation. I always get in trouble with the HR department near the end of the year, because I never use up all my vacation time, and I've resolved to do that this year! One week down, three to go. So I wasn't planning on doing much. Just hangin' out at home, binging some Netflix. I'm actually getting low on entries for Fishing in the Discount Bin, so I should probably watch some more movies and blog about them. Or, with the summer blockbuster season upon us, I should head to the city and check out some of the blockbusters. Like Deadpool 2. Yup, rather than rush out on opening weekend, seeing as to how it was the May long weekend and would no doubt be crowded, I decided to wait until the middle of the week and catch a weekday matinee, when it would be just the seniors looking for an outing, kids skipping school, and me. And it was a good strategy. The theatre was only about half-full. 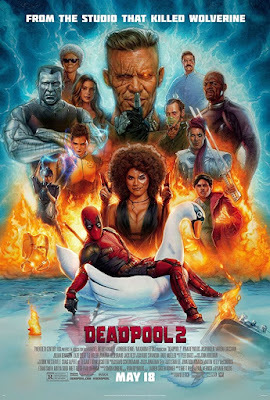 Following the events of the first film, Wade Wilson has settled into the life of a superhero, traveling the world, taking down the worst of the worst. But then, tragedy strikes, as the worst of the worst come seeking retribution, and they take out Wade's beloved Vanessa. Seeking new meaning in his life, Deadpool soon runs into a trouble young kid with fire powers named Russel. And for some reason, Russel is being hunted down by the time-traveling mutant Cable. Deadpool makes it his mission to save Russel from Cable, in order to do so, forms his own team, X-Force. Will X-Force be able to save Russel, and find out why Cable is hunting him down? So Deadpool 2 has got to be as funny as the first film. There's some spectacular set pieces, such as X-Force's first outing, which goes spectacularly wrong. And the post-credits stinger is also hugely meta. If I do have one quibble, it does kind of drag in some places as Deadpool wallows in self-pity for a little too long as he mourns Vanessa. So, yeah. While the highs are high, the lows get pretty low. I liked it, though. In the end, 3 Nibs. Complete review on the website. After that, as much as I was looking forward to just hanging out around the apartment, had to run home to see the folks for a few days. They had a few chores that needed doing, and needed an extra set of hands. Actually, that was the best thing to do. I went home during the height of last week's heat warning. As I live in a top-floor apartment, it usually gets ungodly hot, but when I head home, I choose to sleep in my old childhood bedroom, in the nice, cool basement. So I got some really good sleep out the deal. 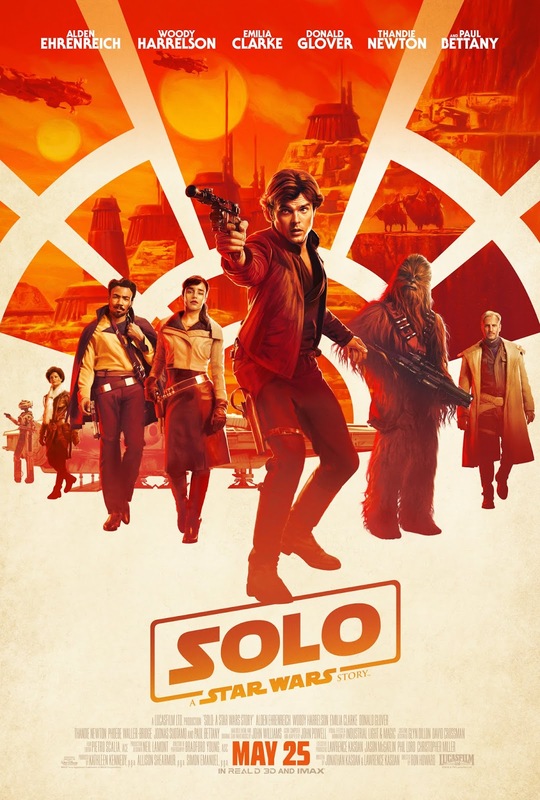 Friday, I decided to head home to Westlock, but not before making a stop in Edmonton to check out the latest Star Wars film, Solo: A Star Wars Story. I was actually kind of sad. I saw it in the North Edmonton Cineplex, instead of West Edmonton Mall, where I've seen every Star Wars film. Well, to be fair, for opening day for Episode I all those years ago, I saw it in Camrose, but I saw it for the second and third time in West Edmonton Mall. Why the WEM boycott for Solo? No big reason...they were only showing it in IMAX, and I didn't want to pay extra. So when Disney first announced that they'd be doing these Star Wars stories outside of the regular saga, Han Solo's secret origin was not one I was chomping at the bit to see. I had no desire to know how he met Chewbacca, or see that game of chance in which he won the Millennium Falcon from Lando Calrissian, or how me made the fabled Kessel run in 12 parsecs. And then, throw in its now legendary production problems, ooo. Didn't know how to proceed. Well, I proceeded the only way I knew how, which was see it on opening day! Again, caught a weekday matinee. Even on release day, the theatre was only about half-full. On the shipbuilding planet of Corellia, we're introduced to young street rat named Han. Han is living a life of indentured servitude to Corellia's crime lords, but dreams of getting off that rock, seeing the stars, and being in charge of his own destiny. He thinks a way to do that would be enlisting in the Imperial forces, but he doesn't take orders so well. When he discovers a smuggler and rogue named Beckett has infiltrated his unit as part of a bigger heist, Han joins Beckett's crew. When the job doesn't go so well, and Beckett and Han are now deep in debt to the crime syndicate Crimson Dawn, Han proposes another risky heist to get Crimson Dawn off their case. But they're going to need a crew: Chewbacca, a Wookie that Han rescued from Imperial captivity; Lando Calrissian, who can provide them with the ship they need; and Qi'ra, the girl Han left behind on Corellia, who found her own way off the planet by enlisting in Crimson Dawn. Can this ragtag bunch pull off the heist? Firstly, Donald Glover is awesome as young Lando. He is just so spot-on perfect. In fact, a lot of the supporting cast shines, like Lando's droid L3-37, who's a crusader for droid rights. There's some great action sequences as well. I mean, who ever thought we'd see a train heist in a Star Wars film? But here we are. Oh, and there's also some great cameos from beloved Star Wars characters. My big quibble, though, has to be Alden Ehrenriech as young Han Solo. I had trouble accepting him. I found him to be a little too chipper as Han Solo. Who knows? We might need a sequel or two to see him fully evolved into that embittered cynic who shot first in the Mos Eisley Cantina. Maybe it was purposeful. Maybe young Han's story isn't finished yet. All in all, though, I still quite enjoyed it. It was fun. 3 Nibs, full review on the website. And then I headed for home. Didn't do much shopping or browsing. I still can't find any Solo: A Star Wars Story action figures to save my hide. And now, as I sit back on this Sunday, getting ready to enjoy the last day of my vacation, I ponder what to do. I'll probably go binge something. Season 2 of one of my favourite Netflix originals, The Toys That Made Us, is now online. It's a fantastic documentary series about action figure lines. It's just so great. Now that summer is here and rerun season is upon us, I'm sure my binging on streaming video services is about to significantly increase. Still haven't gotten around to binging Netflix's Lost in Space reboot, or its last big sci-fi series that dropped a few months ago, Altered Carbon. And I'm also on Crave TV and Amazon Prime Video. I see Crave TV has the first six season of Game of Thrones now, so it might finally be time to see what the fuss is about. Or maybe I'll just stay here, in my second bedroom/home office, where I do all my blogging. I gave it a long-overdue tidying up, spruced it up with some new curtains, and now I kinda like it in here. Crank up some tunes on Spotify, curl up with a good book, and just relax. I dunno. It's the last day of vacation. Gotta do it right.